A foreclosure is a legal process in which the lending bank attempts to recover the balance from a borrower when payments can no longer be made. While foreclosures should never be a good option for borrowers in hardship, it is the unavoidable result if measures are not taken to sell the home. A foreclosure ruins a home owner’s credit and makes it nearly impossible as a borrower to get any kind of loan for a minimum of 5 years or longer. In addition, after a foreclosure, a borrower may be liable for the initial amount owing the lender in many cases. A foreclosure can seem like the easy solution to many people, but it can also be avoided. Talk to a member of our team regarding your options. There has not been a better time to buy a foreclosed home in Las Vegas. With a large amount of inventory available, more than ever before, this makes it an ideal buyers’ market. 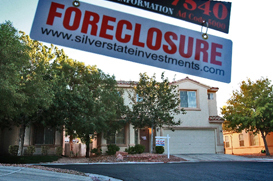 Las Vegas has been ranked on the top of the country’s most hard hit foreclosure lists. Some foreclosed homes in the Las Vegas Valley can be purchased 50 percent or more below market value. Having a good supply of inventory combined with low interest rates can equate to great values and many purchasing opportunities. For many buyers, this is a chance of a lifetime to purchase properties below market value. Many different types of properties go into foreclosure from high rise condominiums to single family homes. The two most common ways to purchase a foreclosed home in Las Vegas is through a Real estate agent or a public auction. Seeking the advice of a Real Estate Professional specializing in foreclosures will give you a better understanding if the buying process is the right one for you. Call our team of specialists who can answer your questions.